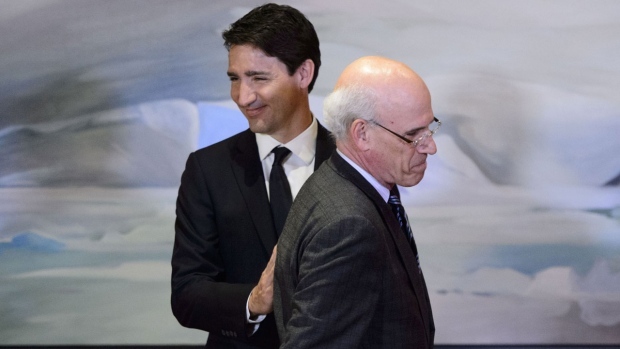 OTTAWA -- The SNC-Lavalin affair claimed its fourth resignation Monday as Michael Wernick announced he will step down as the country's top public servant, having concluded he's lost the trust of opposition parties. In a letter to Prime Minister Justin Trudeau on Monday, Wernick said he will retire before this fall's federal election campaign kicks off. He noted that the clerk is supposed to be "an impartial arbiter of whether serious foreign interference" occurs during the campaign, as part of a new federal watchdog panel, and is also supposed to be ready to help whichever party is elected to form government -- two roles he no longer believes he can fulfil. "It is now apparent that there is no path for me to have a relationship of mutual trust and respect with the leaders of the opposition parties," Wernick wrote. "I wish to relinquish these roles before the election. It is essential that Canadians continue to see their world-leading public service as non-partisan and there to provide excellent services to Canadians and the governments they elect." Wilson-Raybould has accused Wernick of making "veiled threats" that she'd lose her job as justice minister and attorney general if she didn't cave in to pressure last fall from Trudeau and his senior staff to halt the criminal prosecution of SNC-Lavalin on charges of bribery and corruption related to contracts in Libya. She has said they pushed her to instruct the director of public prosecutions to negotiate a remediation agreement with the Montreal engineering giant, which would have forced the company to pay stiff penalties but let it avoid the risk of a criminal conviction that could threaten its financial viability. Wernick's decision to quit as well proves "this SNC-Lavalin scandal is even bigger than we thought," said Conservative MP Pierre Poilievre. On his way into the House of Commons, Trudeau thanked the clerk for his "extraordinary service to Canada over many, many decades" and credited his government's accomplishments "definitely in large part" to Wernick's leadership of the public service. Trudeau did not respond when asked if he'd sought Wernick's resignation but his office later said he had not. Opposition members erupted in protest when Trudeau announced he'd appointed former Liberal justice minister Anne McLellan as a special adviser to explore what he called "important questions" about the relationship between the federal government and the minister of justice, who plays a dual role as attorney general. While the justice minister is a political player, the attorney general is supposed to make independent, impartial decisions about prosecutions. McLellan "will assess the structure that has been in place since Confederation, of a single minister holding the positions of minister of justice and attorney general of Canada," the prime minister said in a statement. "She will consider whether machinery-of-government or legislative changes may or may not be recommended." "Her work will be another important step towards maintaining Canadians' confidence in their institutions," he told the Commons. Conservative Leader Andrew Scheer mocked the announcement as nothing more than saying "Liberals will investigate Liberals." New Democrat MP Charlie Angus ridiculed the idea of a Liberal minister from the era of the sponsorship scandal looking into the SNC-Lavalin affair, which he dubbed "a five-alarm dumpster fire." "I think once we saw how much of an active political player Mr. Wernick was in the SNC scandal, it became impossible for him to carry on his job, which is to have the trust of all parliamentarians on key matters of policy," he said outside the Commons. Angus also said Wernick should have "known better" in the way he presented himself before the justice committee, suggesting he was combative, evasive and partisan. MPs on the committee were taken aback when he prefaced his initial testimony with a diatribe about the deteriorating tenor of political discourse, with incitements to violence that he said made him fear someone will be assassinated during the coming election campaign. He cited the example of a Conservative senator who'd urged truckers in a pipeline protest on Parliament Hill to "roll over every Liberal" in the country. Wernick engaged in a number of testy exchanges with opposition MPs. In a second appearance, he suggested profane messages he received through the social media "vomitorium" after his first appearance amounted to witness intimidation. But the five Liberals on the justice committee -- Edmonton's Randy Boissonault, Toronto-area MPs Iqra Khalid and Ali Ehassi, B.C. 's Ron McKinnon and Nova Scotia's Colin Fraser -- tipped their hand in an open letter to their fellow Liberal who chairs it, Anthony Housefather. "The committee has heard from principal witnesses in this matter," their joint letter says, including Wernick, Wilson-Raybould, and Trudeau's top aide Gerald Butts. They've met for 13 hours of testimony over 11 meetings, it says, and "Canadians can judge for themselves the facts, perspectives and relevant legal principles ... As committee members, we have achieved our objectives with respect to these meetings." In the Commons, Trudeau himself likewise argued that the committee has been meeting for five weeks and has heard "all perspectives." He suggested further inquiry should be left to the federal ethics commissioner.